DAMASCUS, June 04. /ITAR-TASS/. Observers at the presidential elections in Syria are unanimous that the expression of people's will was valid and the polls passed in a democratic and positive atmosphere. On Wednesday morning, observers met for a roundtable meeting at Dama Rose Hotel to give their assessment to presidential elections. Observers include members of parliaments from Russia, Iran, Brazil, Venezuela, North Korea, Tajikistan, the Philippines, Uganda, as well as representatives of Canada, the United States, Ireland, Pakistan, Malaysia and Bahrain. An Iranian observer opened the meeting accusing the US and its European allies of the policy of double standards when “an obvious free choice of Syrian people is put into doubt by Washington and its allies.” He urged a US observer to explain why such anti-Syrian hysteria took place. However, the US observer levelled a harsh criticism on the White House, pledging that upon return to the homeland, he would inform the Americans about a real situation in Syria. The meeting continues behind closed doors. 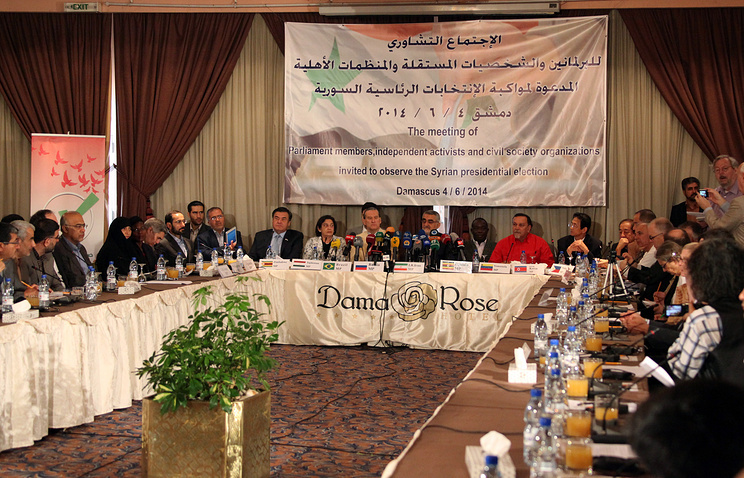 Observers promise to inform the press about the results of the meeting after consultations.